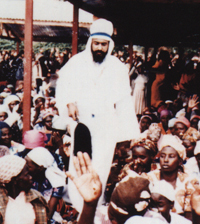 Maitreya, as he appeared ‘out of the blue’ before 6,000 people at an open-air prayer/healing meeting in Nairobi, Kenya on June 11, 1988. 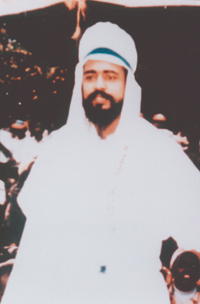 Maitreya was photographed addressing (in their own language) thousands of people who instantly recognized Him as the Christ. The story and photographs we reported by major media including CNN. Share International is a world-wide network of volunteers who disseminate information about the presence in the world today of great Spiritual Teachers, led by the World Teacher – Maitreya. The Teachers’ role is to inspire and guide humanity out of its present political, economic, social, environmental and spiritual crisis. In this time of major transition, the Spiritual Hierarchies of all planets within our solar system are visiting Earth to facilitate the birth of a new consciousness. Benjamin Creme, chief spokesperson for Share International, says our Space Brothers are engaged in a spiritual mission to save our planet from further destruction. Our own planetary Hierarchy, led by Maitreya, works tirelessly with them in a fraternal enterprise to restore sanity to the Earth. For the Spiritual Hierarchy, right human relationship means embracing cooperation, with sharing, justice and freedom as its hallmarks. When we banish war and live in right relationship, our Space Brothers are prepared to offer a new technology that will provide free energy to all. Share International makes available the spiritually-based philosophy known as the Ageless Wisdom Teachings and encourages practical spirituality through meditation and world service. It publishes works by Benjamin Creme, Share International magazine, and The Emergence Quarterly newspaper.